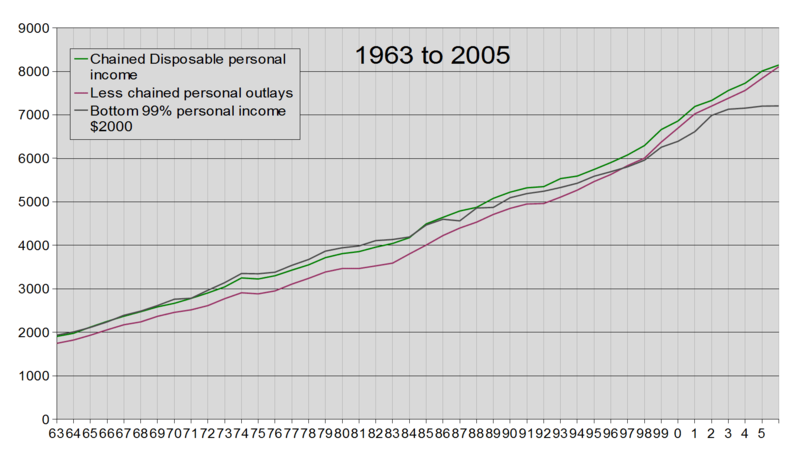 I’ve been doing some numbers concerning personal income. Breaking out share of income, savings, GDP, etc based on BEA data and Saez’s data. 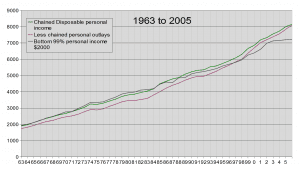 I’m playing with it, have converted it to year 2000 dollars and will be looking at per capita relations too. Even thinking of converting it all to 1929 dollars. I plan a few posts on it all. But, considering the post today concerning the dollar, I thought these two charts would be of interest. These two charts are in 2000 dollars. There is an interesting hump around WW 2, I’ll get to that in a later post. But for now, look at the 3 lines and pay attention to what crosses what. Now, look at this chart. See anything of interest? Something around 1996? Now, Sherman, set the WABAC machine to 1929 and look forward.